I come from the mix-tape generation, that sweet spot when vinyl records overlapped with cassette tapes. Most importantly, car radios incorporated cassette players. Dolby noise suppression which buried much of the hiss and pop from poor stereo equipment probably helped, also. Then came those weird few years when auto sound systems replaced cassette players with compact disc players, before Bluetooth combined with a streaming service made even that irrelevant. So, mix-tapes evolved into mix-discs. I’ve spent a lot of time on long drives, listening to whatever seemed like a good idea when the trip started. You needed a supply of music for those long distances filled with bad radio. A few years ago, it was pointed out that the “mixes” I made shared at least one song rather often. I had not noticed. that Axis: Bold as Love is one of my all-time favorite albums, but I had no idea that I favored one song off it above the rest. Really, not Little Wing? As song that I play often enough in cover versions by Gil Evans and Derek and the Dominoes (two distinct versions, though… well… interesting thought)? You don’t grow up liking rock and roll without developing an appreciation for the basic four instruments: guitar, drums, bass guitar, and voice. After that, it’s a pretty straight leap to the fact that Hendrix was awfully good on the guitar. Many would say the best and I don’t dispute that. I want to, but I can’t think of anyone I enjoy listening to more. But Castles Made of Sand makes me jump the tracks a bit (or maybe I’m jumping the shark). I really like the vocals. In fact, I would go so far to suggest that they stray pretty far afield from traditional rock vocals. They remind me of Frank Sinatra. That seems strange until I look at when Hendrix came of age. All artists that develop quickly share one common trait: they absorb all available influences. 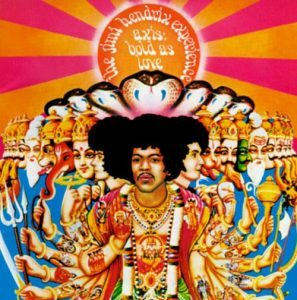 Set aside a couple hours and listen to the four albums that Hendrix authorized during his brief recording career. Everything was an influence. The most difficult thing about being an artist is to make time for other art than your own. The other night, at a Patti Smith concert, she spoke about having spent the afternoon at the Cleveland Museum of Art. Elvis Costello has mentioned making time to hit whatever museums are nearby while on tour. Nothing worthwhile comes out if nothing worthwhile goes in. You’ve Got to Check This Out is a blog series about music, words, and all sorts of artistic matters. It started with an explanation. 140 more to go.